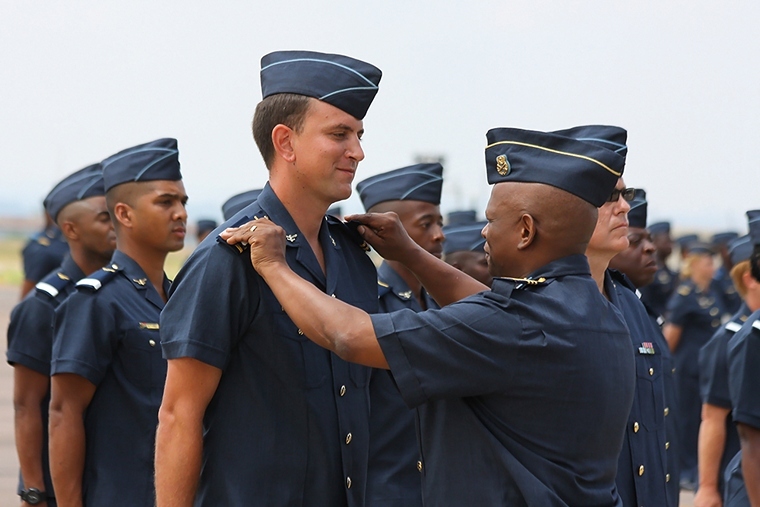 The South African Air Force celebrated 95 years of existence with a Joint Air Force Day and Commissioning Parade held on the hardstand at 60squadron at AFB Waterkloof. The Chief of the Air Force Lieutenant General Fabian Z Msimang was appointed as Revue Officer for the day's proceedings. The parade was opened by a General Salute and a flypast by an Agusta A109 and Oryx helicopter flying the National flag and the SAAF respectively, both of these helicopters are based at 16squadron AFB Zwartkop, followed by the customary reciting of the SANDF code of conduct and scripture reading and prayer. Lt Gen Msimang then inspected the parade. The well-rehearsed parade then marched past in columns of three with Lt Gen Msimang acknowledging the salute of all the represented groups present at the parade. As this was a joint Commissioning and Air Force day parade one of the Candidate Officers addressed the large crowd of SAAF members, Foreign Military Attaches and members of the public on behalf of the graduates of SAAF College. The Officer Commanding SAAF College Col van Aswegen also addressed the parade praising the graduates for their level of endurance, both physically and intellectually in successfully completing the completing the Officer Formation Course. Lt Gen Msimang unveiled the commissions of the 31 candidate officers effectively promoting them from Candidate Officers to various junior officer ranks. 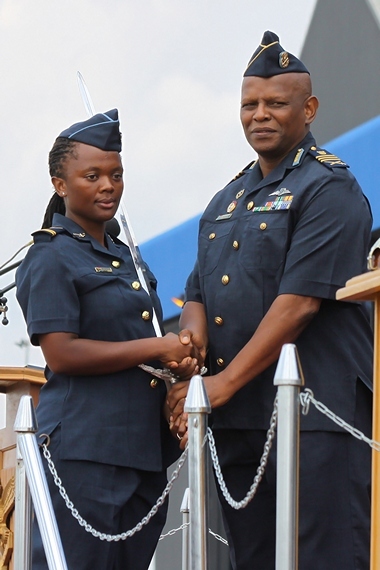 A newly commissioned Lieutenant was presented with the “Sword of Honour” as CO who excelled the most during her twenty two weeks of training; the Sword of Honour was donated to the SAAF college by the Royal Air Force to inspire candidates to excel at the highest level during the officer formation course. 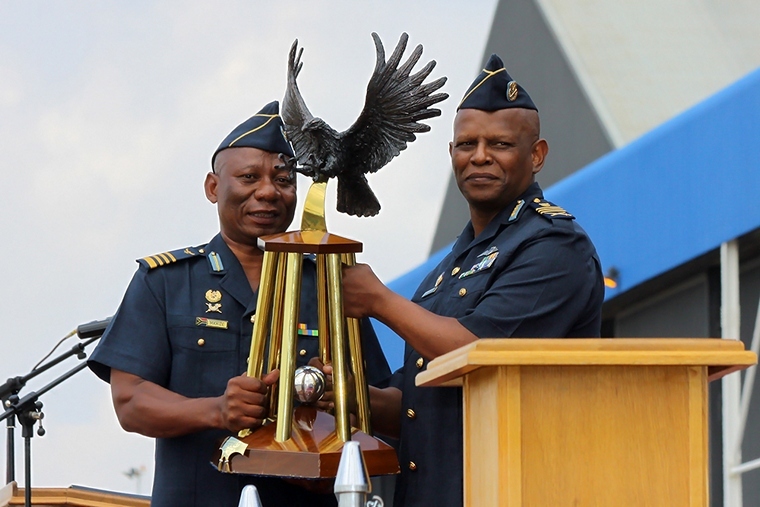 Air Force Bloemspruit was announced as the Prestige Unit of the year for 2014, Col Oscar Mkhize accepted the impressive Eagle floating trophy. AFB Ysterplaat and AFB Langebaan were the runners up for this prestigious award. In his address Gen Msimang commended the members of the SAAF on their growing sense of patriotism ,service and commitment to building a “Powerful and Committed Air Force that inspires Confidence and a spirit of steadfastness, to weather the most challenging of storms of Modern times“. “Apart from bearing witness to this commissioning parade of these new officers…we are commemorating the 95th anniversary of the South African Air Force...the second oldest in air force in the world. Through its 95 years of existence, it is evident that the South African Air Force has, and must continue to guarantee air power excellence in everything that it does. How else can it therefore be of consequence and a beacon of hope, if it does not appropriate its role in the African Agenda? This is one of the fundamental reasons compelling the South African Air Force in the coming financial year…to give special attention to capacity building and the enhancement of its capabilities. 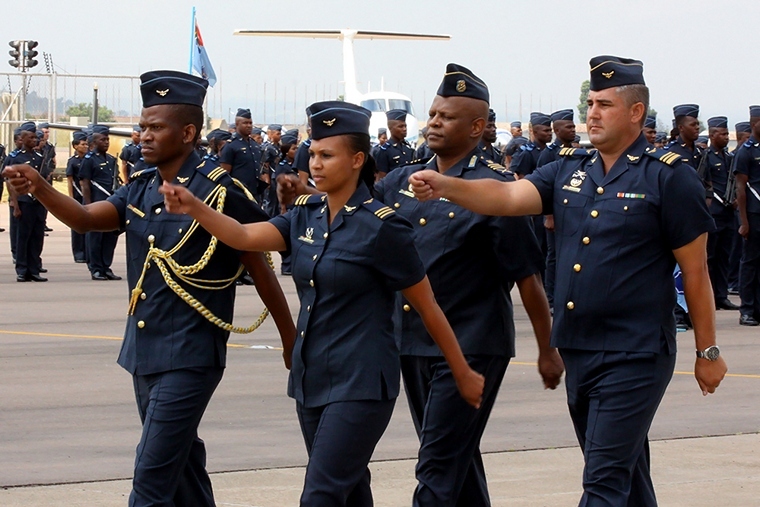 “Transformation, capacity building, career planning, exchange programmes with other air forces, foreign learning opportunities, capturing our collective history, back to basics and introducing chess to the whole of the Air Force will be some of my focus areas for this year,” Msimang told assembled guests as well as the hundreds of Air Force personnel taking part in the parade. “One of the Ministerial Priorities is the transformation and revitalisation of the Reserves. It is my intent to build the SAAF Reserve Force capability that is relevant and potent in all mustering's, and to support the Reserve Force Flying Squadrons. Proper career planning and administration of the SAAF Reserve Force members will be high on my agenda this year.” Msimang added that the University Reserve Training Programme continues to be implemented by the South African Air Force. “Given the Government's focus on Peace, Security and Stability on the African continent, each and every one of us must be combat ready to respond and to defend our territorial integrity and national interest. His Excellency Mr Jacob Zuma, President of the Republic and the Commander In Chief of the SANDF, stated in his address on the occasion of the Mandela Medal Parade, Waterkloof Air Force Base on the 7th of December last year, 'Our soldiers are highly regarded with regards to peacekeeping and post-conflict reconciliation missions under the auspices of the United Nations, the African Union and the Southern African Development Community. We have indeed made an indelible mark in the field of Peace Support Operations and have become a key role player,'” Msimang said. “As you may recall, last year we hosted what has now become a national asset in the form of the Africa Aerospace and Defence (AAD). Whilst there may have been challenges, this instalment of the show was the most successful to date…we now look forward to AAD 2016 and trust that we can count on your support and positive contributions for another great successful event. 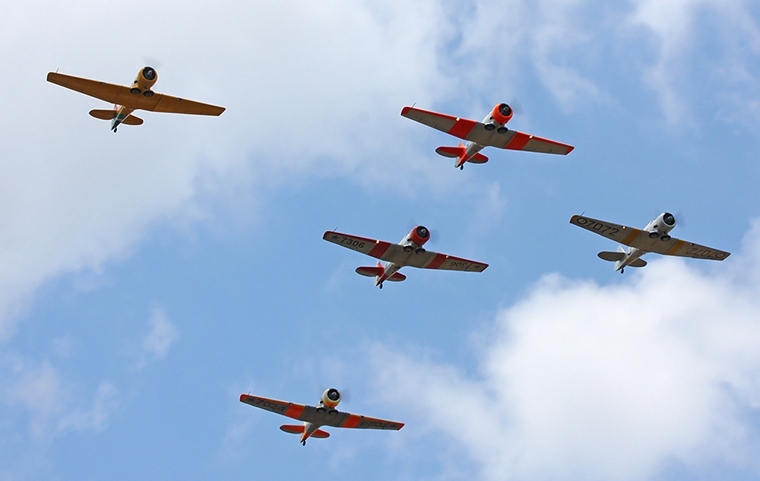 The parade was closed by a four wave flypast by the SAAF Museum led by a flight of two Alouette IIIs, an Alouette II and a Puma followed by a Bosbok, Kudu and Albatross; five Harvards, and finally a Vampire. It was a great pity that none of the currently serving aircraft were used in the flypast.